Closure Panels are a finishing element added to a grandstand or bleacher that adds not only safety and maintenance benefits, but also a finishing touch that makes a lasting impression. Closure Panels are often added to stairs, ramps, elevated walkways, handicap areas, mid-cross aisles, and press boxes to complete the look and provide added functionality and safety. Architectural Panels. This system offers a classic, rich masonry texture look to enclose the exposed structure of stadium elements. With the look of real bricks, your facility will receive a classic ballpark aesthetic at a fraction of the cost. Poly Panels. This non-corrosive, impact-resistant Poly Panel System is made of 100% recycled material and serves to conceal cross braces and framing material with solid, flat panels to give the stadium a more polished look. 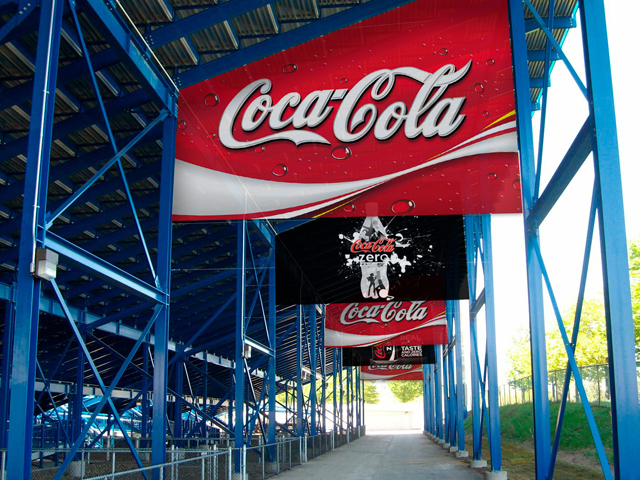 Aside from the aesthetic appeal, this system also enhances revenue generation by increasing the ability to affix sponsor/donor signage or logos, promotes safety by eliminating under-bleacher access, and increases function by lowering time and expense of clean up under bleachers. Choose from 10 standard colors. Aluminum. This is the most cost-effective way to enclose your bleachers and decrease maintenance costs while also increasing traffic control abilities. These powder coated systems visually enhance the overall look of the grandstand while displaying team colors and projecting team colors. Whatever your needs may be, Toadvine Enterprises can help you secure a closure system that will boost your visual presence. Contact us to learn more. When planning a sports stadium or just updating your equipment to meet safety requirements, adding a railing system can add a prominent feature to your seating and promote a higher level of safety for your patrons. When you choose Toadvine, you are not limited to a simple banister style railing. We offer three types of railing systems and multiple styles with each option. Here are the various railing styles we offer and some of the options you can choose for each one. We would like to help you plan your sports facility and assist you in adding any equipment that will help make your bleachers safer and more accessible for your fans. For more information on how Toadvine can meet your school's seating needs, fill out our Railing Systems Quote form on the right and one of our qualified team members will contact you to discuss your needs and provide you with a free quote. Which Bleachers are Best for Your Football Stadium? 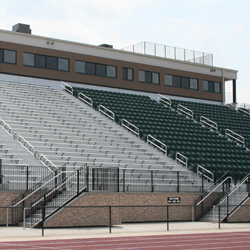 Whether you are trying to "tackle" the planning of a new football stadium, or conducting a major overha ul on an outdated one, Toadvine Enterprises has a variety of bleacher seating options to accommodate fans and spectators alike. The I-Beam Grandstand football bleachers are made with an enduring steel frame, stunning appearance and cost effective price. They are a perfect match for high school and college stadiums desiring seating for 100-10,000 fans. The Alum - A - Stand is known for its durability and strength. These bleachers offer a variety of arrangements from portable to larger stationary bleachers. 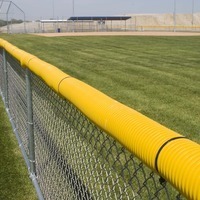 Unlike steel framed bleachers, the aluminum tube and channel under structure is rust-resistant. With its wide range of customizable color options, this bleacher system is a perfect seating solution for your school. The hybrid precast stadium system is a patented steel seating structure that is economical and made with lightweight precast concrete and is completely customizable to your school's needs. 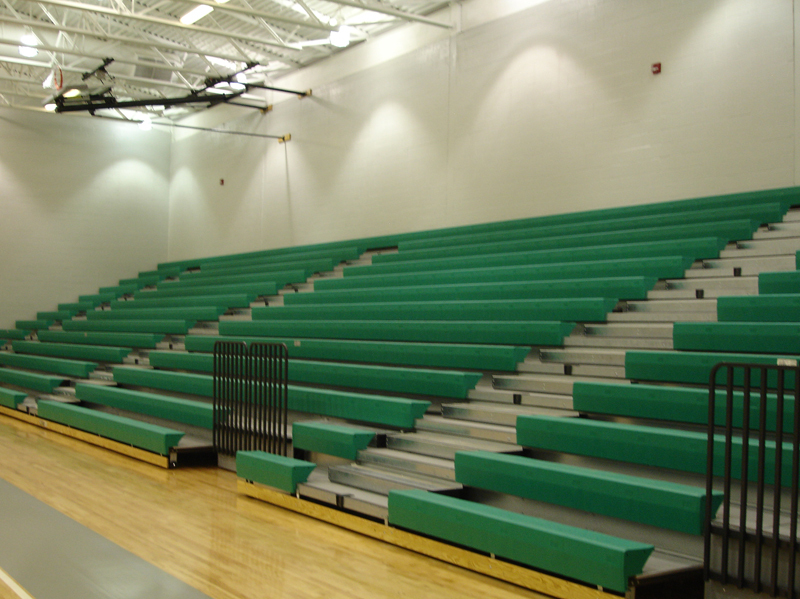 Angle Frame Bleachers can be used in a variety of ways for your seating needs. From fan bleachers on the football or soccer field, spectator seating at your tennis court and baseball field, to additional resting spots at your local recreational park, Toadvine can meet all of your outdoor seating needs with our customized Angle Frame Bleacher. This bleacher can be customized with many options and constructed to seat anywhere from 20-600 spectators. Contact Toadvine today to discuss how we can best accommodate your school's seating needs and get your stadium plans off the ground and running. Choosing the right type of sign that gets the most notice is so important for both your business sponsor and your program. Dant Clayton has produced a new light weight sign that will meet both budget and ease of use. These light weight signs are so versatile they can be hung just about anywhere and that gives you more opportunities for raising support than you used to have. Since they are so easy and light you can put signs where you did not have them formerly. These signs are designed specifically to be installed on structures like bleachers and high pedestrian traffic areas. Cost: Most times these light weight signs from Dant Clayton are less than half the cost of their aluminum counterparts. By reducing the costs by over half, you can put those savings right back into your facility. Still charge your business sponsors the same amount and use those funds for better equipment. Easily Relocate: These signs are a fraction of the weight of the aluminum signs and can easily be installed, removed, and relocated when you want to use them in other areas. You can remove them each season and protect them from weathering in outdoor facilities. Wow Factor: These new, light weight signs have amazing color and graphic options. Your supporters will be impressed with the new look and it can transform the feel of your entire facility from ordinary to highly professional. Your sponsors will be impressed with the upgrade in look and feel. Opportunity For New Funds: Since these signs are such a great improvement, you may want to consider replacing older signage for new fundraising opportunities. Go to your current sponsors and have them renew their support. Take sample signage with you for them to see how much nicer and impressive they are. Call us today with your questions about Dant Clayton’s light weight signage! There is never a wrong time to invest in your program or facility. Now is the time to be inspecting your bleachers and scoreboards. You do not want to be midway through the season and have a problem that delays your season, forfeits a match, or results in an injury. Toadvine Enterprises and Vine and Branch have developed a maintenance program that inspects your equipment using fully manufacturer-certified technicians. Using certified technicians to inspect your equipment ensures the safety of your seating. According to the National Fire Protection Association (NFPA), all outdoor grandstands and folding or telescoping seating must be inspected annually by an engineer, registered architect, or manufacturer-certified inspector. It just makes sense to have your equipment inspected by someone who is an expert of that equipment. That is where Toadvine Enterprises comes in. We live and breathe seating and sports facility equipment, so when we finish inspecting your seating, let us inspect your scoreboards and other facility equipment. You save time and money by combining these services and you can take advantage of our expertise in this industry. We can share all the latest benefits of new products and help you extend the life of your existing equipment. 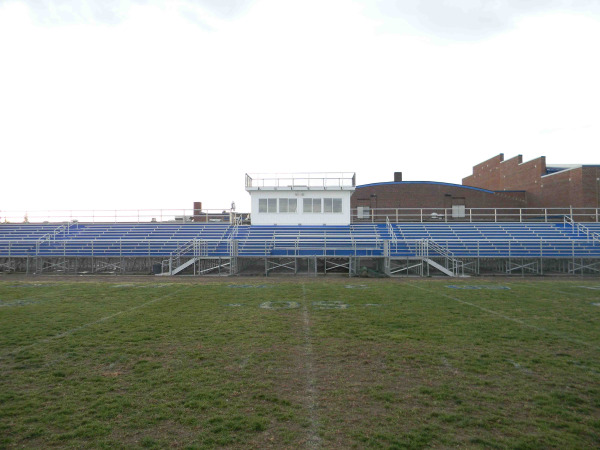 Give us a call today to schedule your bleacher inspection. Toadvine Enterprises (502) 241-6010.